Viceroy Research, which in the past has released damaging reports on companies like Steinhoff and Capitec, released on Thursday 28/11 a report on NEPI Rockcastle [JSE:NRP]. Viceroy says its investigations have “uncovered numerous inconsistencies within NEPI Rockcastle’s financial reporting and major links to an established financial fraud”. The share price reaction was very negative, plunging 14.5% by lunch time on the JSE. A summary and link to the report can be found here. NEPI Rockcastle (NRP) is one of the largest constituents in the FTSE/JSE SA Listed Property Index, with a 13.70% weight in the index. Passive funds tracking the index are also being impacted. 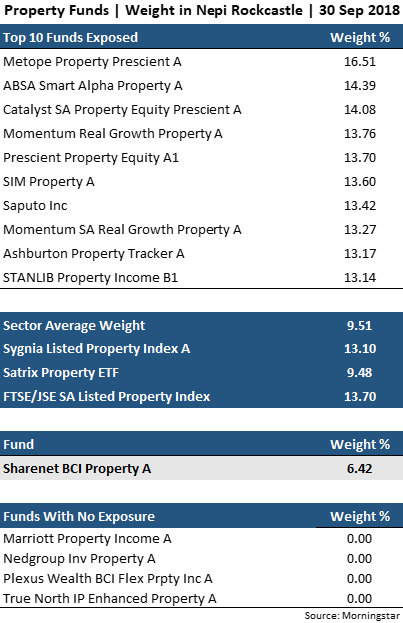 Looking at end of September holdings data: Sygnia’s Listed Property Index holds 13.10% NRP while the Satrix Property ETF has 9.48% exposure to NRP. Satrix has a 10% cap on the weight of each underlying share and this clearly benefits the fund by keeping the concentration of its positions in any single share to a palatable weight. Active managers are expected to manage risk in their portfolios and should have the upper hand versus their passive peers, but some managers were caught out. The average weight in NRP held by active managers was 9.51% at the end of September 2018. At the time of writing only a few funds have updated holdings to the end of October 2018. The highest exposed fund at this date was Metope Property Prescient with 16.51%. Only 4 out of 36 actively managed funds did not hold any NEPI Rockcastle in their portfolios. A summary is given in the below table. The Sharenet BCI Property Fund had 6.42% invested in NEPI Rockcastle, less than half the weight in the benchmark. Our substantial underweight was due to risks associated with the company. These risks need to be balanced with benchmark risk that arises from deviating from benchmark weights. Sharenet Investments has a range of unit trusts and solutions making use of both index trackers and active managers. Investment decisions are also backed by a firm and reliable asset allocation process.